FA: John Bachar, Ron Peers, July 1981. The largest black streak on Medlicott Dome is the heinously runout Bachar testpiece You Asked For It. With precisely four bolts and one cam placement in three pitches of sustained face climbing and slab, You Asked For It is even more runout than another black streak that Bachar established a month later – the Bachar/Yerian. 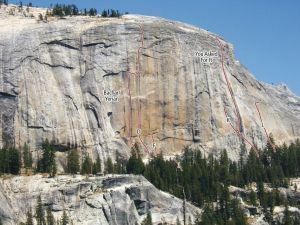 The rating of the crux first pitch is old-school, with moves that on a modern sport climb would be called 5.11 – yet even when old-school ratings were standard, Bachar originally sandbagged locals, calling it 5.10a. The right start variation is Free For All, established three years later by Bachar and Mike Lechlinski. Despite the easier rating, You Asked For It sees far less traffic than the Bachar/Yerian, probably because the hard climbing is more dangerous, slabs are not in fashion, and the climb is “only 5.10.” You Asked For It has a ledge to hit for the crux first pitch, and sustained slab climbing with gigantic fall potential on lower-angled rock, while 50 to 90-foot falls off of the Bachar/Yerian result in huge air time but not that many serious injuries. Which SuperTopo guidebooks include a topo for You Asked For It?